Getting Tibet Travel Permit (TTP) is not a difficult thing if you follow the right instructions. The following three simple but important steps make the comprehensive Tibet permits application process well explained. Once your Tibet tour is booked with reliable agent, just provide the appropriate travel document on time and they will take care of the rest. To get proper Tibet travel documents especially in face of the constantly changing restrictions on foreign travelers is a time consuming process. Since independent tourists attractions sightseeing in Tibet is not possible for foreign travelers, they must have a guided “TOUR SIGHTSEEING” for anytime out of Lhasa, while when foreign travelers are in Lhasa, they also need a tour guide for any visit to monasteries, temples, nunneries, palaces, etc, however, they do not have to hire a guide for their free days in Lhasa when there is no tour attractions visit. So during the free days in Lhasa, you can wander around, rest well, walk in many of the traditional or unique streets, enjoy the flea market shopping, try many local food, and there many more personal things to do. Your Tibetan guide will recommend you man meaningful things to do or try for your free time in Lhasa. So you can surely maximize your own holiday in Tibet. As a legal registered Lhasa local travel agency, we are able to provide all necessary and proper Tibet travel permits. Here below lets us provide you the important guidelines about Tibet travel permits application. Step 1: Choose Tibet travel agency, confirm tour in advance and email passport copies 15-40 days before arrival date! Negotiate with 4-5 Tibet travel agencies and narrow down the Tibet tour choices, and choose a Reliable agency with BETTER offer, then send all your passports data page photo copies, meanwhile pay a deposit to secure your Tibet tour booking. You can use your smart phone to take picture of your passport data page and email to travel agent. While you can email the Chinese visa page 5 days to 1 month in advance (per your convenience), if you do not have China visa in hand upon booking, please do not mention to Chinese embassy that your destination covers Tibet, so it is easier for you to get China visa in your country. Many of our clients from New Zealand, Australia, America, Vietnam, Thailand, Malaysia, Japan and Europe did this without any hassles for applying Chinese visas. However if you enter Tibet from Nepal, you do not need to apply Chinese visa in your country, but travel agency here in Tibet will get it done for you. Be sure you have 3 working days in Kathmandu to take the visa (nicknamed as Tibet Group visa), but please note that, you need to book the Tibet tour 15 days to 35 days in advance for agencies here in Tibet to apply for that visa invitation letter together with Tibet travel permits. You must present the permit when boarding the plane to Lhasa from any cities in mainland China, so is it for train entry from Chongqing, Xi’an and Lanzhou.Therefore, your Tibet travel agent will mail the Tibet travel permit to your hotel or living address in China. Let your travel agency know which hotel you will be staying at prior to your arrival in Tibet, but please note that: you need to provide the accurate address at least 5-8 days before arrival date. If entering through Nepal, your tour guide will meet you at the border or airport with Original Tibet Travel Permit (TTP), because you just need the Tibet Group visa to board the plane from Kathmandu Tribhuvan International Airport. 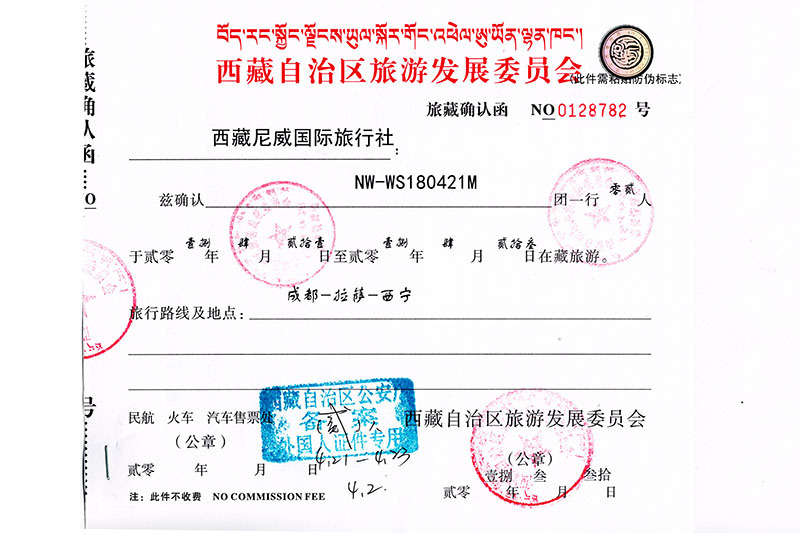 Further more, as reliable Tibet travel agency, we do not suggest to post the permits document from Lhasa to your own country since this is very risky, our gov will block the international parcel for Tibet outbound packages. Once Tibet travel permits application is in correct process, your Tibet travel permits are in the right hand. And normally reliable Tibet travel agencies can get permits ready even 1 month in advance and they will inform you that your permits are ready for post. So please expect the permits delivery on time, and once you or your colleagues or friends receive the permits by address you provided in China, please report to your agency that you well received the permits. This is hassle free for you and you can prepare for the Tibet tour packing. However, additional Tibet travelling permit will be need after your arrival in Tibet if your trip covers Everest Base Camp (EBC), and Kailash, etc. But you never worry about this, since travel agency staff (such as permits person or tour guide) will help handle this at the designated PSB (Public Security Bureau) with your original passports. Read further about other Tibet travel permits documents you will need for comprehensive Tibet travel. Of course you will need personal passports to travel in China. Please double check your passport is with at least 6 month valid duration after arrival date in China. If not, please apply one easily in your home country. When applying for your Chinese visa it is recommended that you indicate your city of arrival (e.g. Beijing) as your destination in China rather than mentioning Tibet. If you enter from Nepal, your travel agency will help you obtain a separate visa from the Chinese consulate in Kathmandu. It is mandatory regardless of whether or not you have a Chinese visa already. Unfortunately there are additional restrictions on Tibet travel permits for diplomats, government officials, military, and journalists. Check with your agency before booking your trip. Permit applications are seldom declined as long as you provide all required documents on time. Also, depending on the time of year and local political climate, there may be additional restrictions on group sizes and travel to certain areas of Tibet. When booking your trip it is important to remember that government regulations can prevent all Tibet travel permits from being issued with little to no advanced notice. Your travel agency will keep you updated on changes in regulations. It is important to listen to your tour consultant and be respectful of the local laws, especially in sensitive areas. You know, why it is important? USA president Donald J. Trump even signed new law about Chinese official travel ban to USA because of Tibet tour restrictions for foreign travelers. Read further for the most up to date information about Tibet travel permits, and you can simply contact Tibet Travel Expert Service by email to [email protected].